My Japanese embroidery class was wildly successful (meaning that nobody dropped out and the projector didn't die in the middle of a lecture). I can now relax for a week here in beautiful Bath before boarding yet another plane for home. In the meantime, here's a bit of Neibling's brilliant Lyra (scroll down Jane's page to see the finished piece). This is a complicated knit, but wonderful fun--each pattern row is different and there's a resting knit row between them. I first swatched with Zephyr, but decided the yarn was too indelicate, so I switched over to Gentle in the Dark Ruby color. I am sorry I had to leave it back in the US, but I have too much to do here in England and this piece requires concentration. 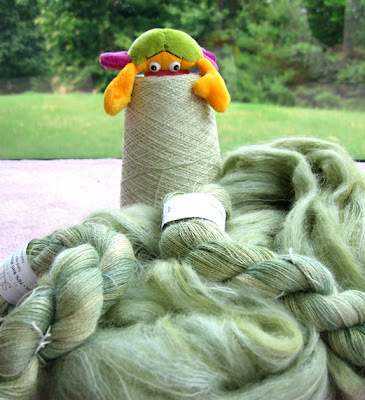 I did, however, bring the Wings of the Moth, which is being worked in pale green Art Yarns mohair/silk. 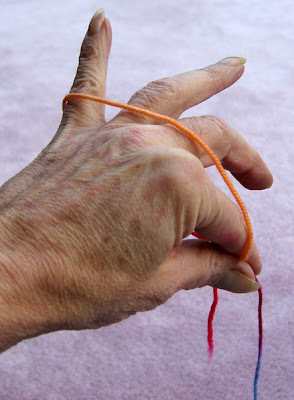 The pattern requires no concentration whatsoever and the silky, fuzzy yarn is especially pleasant to handle in the lovely cool weather we are having here. The pale green is very slightly variegated and the exact color of a Luna moth. This was the yarn reserved for the Bee shawl, so now I have to go yarn shopping again. Darn! 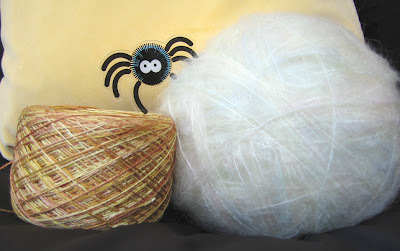 2Trees just received her biohazard-free yarn from Yubina. 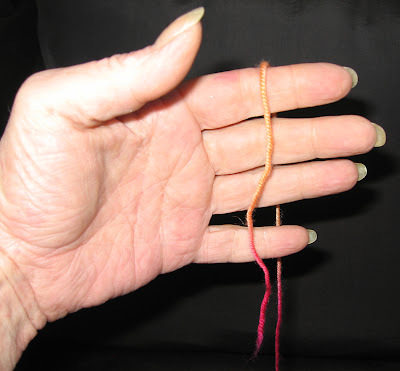 If you don't want to order any inexpensive cashmere and/or cashmere silk lace yarn of cheek-rubbing softness, don't go to her blog entry. I am currently in England with no time to knit. The light in the room is dim enough for moles, too--the lamps apparently contain 11-watt bulbs. Not good for lace knitting, finding clothing items, etc. Has anyone ever noticed that British English and American English use the same verbs but different nouns? For example, take the word "boot." The simple sentence "Put it in the boot." can engender a hilarious amount of confusion, as "boot" in this fair isle means the trunk of a car and not an item of footware. I was so taken by Jane's Lyra (actually Neibling's Lyra, but Jane alerted me to the pattern's existence, so she gets my credit), that I dug out the magazine and some black Zephyr to swatch it. I was astounded that the pattern has lain, dust-covered, for years amidst a large stack of Anna magazines. I subscribed to Anna a long time ago when I was in my sweater phase and, after 10 years of staring at ugly sweaters, I stopped my subscription. After I saw Jane's post, I unearthed them from underneath a pile of old notebooks and nearly fainted with delight. They are FULL of Neibling designs. I found about 20 of them, including the gorgeous Lyra design. I am a disaster with a crochet hook and DPN's are not my favorite,* so I spent an hour inventing a nice, simple way to begin circular shawls. This is picture-intensive and I hope I can explain it so everyone can give it a try. 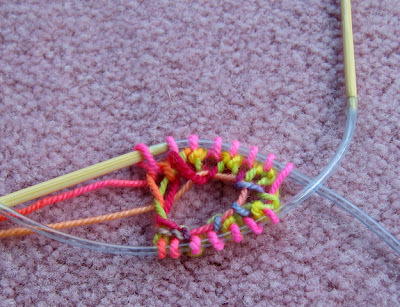 Basically, you make a loop and knit into it. When you have the correct number of stitches, you can arrange them on either DPNs or, as I did, two circulars and start knitting. 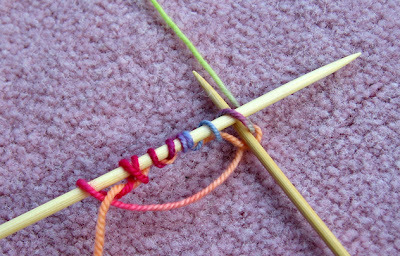 After a few rows, or whenever you feel like it, you just pull on the end to close the circle. 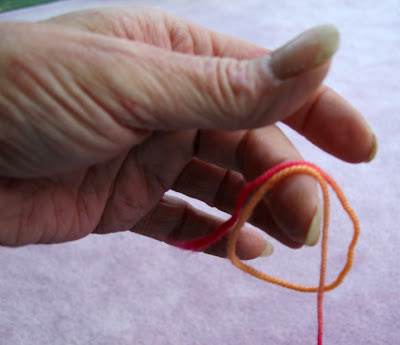 Aside from not having to find or use a crochet hook, tatting shuttle, or any other esoteric object, the advantage of this method is that you can make the central loop nice and large. 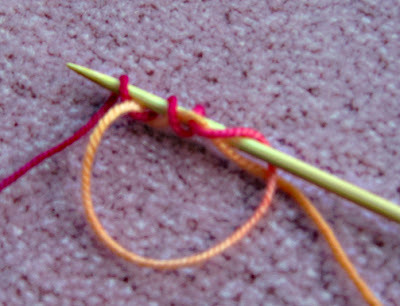 Doing so makes it easier to manipulate the multiple needles you need for circular beginnings. I have never seen this method anywhere, but if someone else invented it already, my apologies for restating your elegant technique. 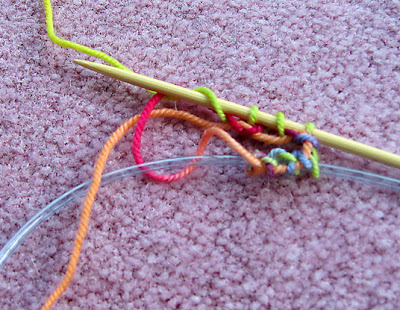 Insert the needle into the loop..
...And bring the yarn over the top. One stitch made. 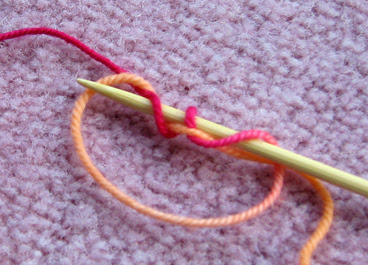 Now go under the needle and wrap the yarn for the second stitch. ..and under as many times as you need stitches. End by going under, not over. 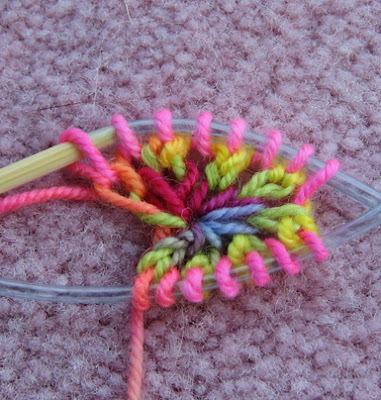 You'll see why when you start to knit. 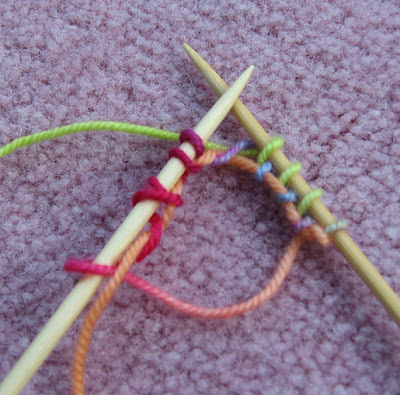 The exact number isn't important, because you can slip off the excess stitch(es) later. Here I am starting the second circ. And I am at the end of the round, ready to start the second one. 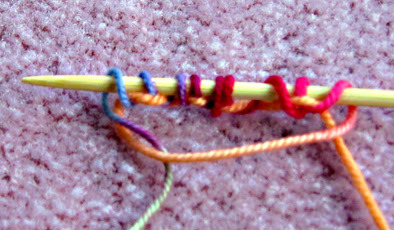 Pull on the end of the yarn to close the hole. I love those 99-cent bamboo needles, too! *I loathe, hate, and detest DPNs. With all due respect to the designer, the Icelandic shawl was a yawner to knit. Fortunately, it's actually quite small when knitted with lace yarn, so the boredom didn't last long. The yarn used, Richmore's Count 10 Color #103, is a variegated mohair with loooooong color runs. It was a truly luscious knit--the stuff is softer than Kidsilk Haze. Several folks have ordered some from Japan via Crescent. Treat yourself--it's fabulous stuff. I am in my usual unsettled quandary about the next project. I swatched three different yarns for the Mediterranean shawl in Gathering of Lace and they all looked, well, meh. I guess I wasn't in a Mediterranean mood this morning. The shawl also requires a humongous amount of yarn--about 3600 yards--and I could see that I would be knitting it for years and years. 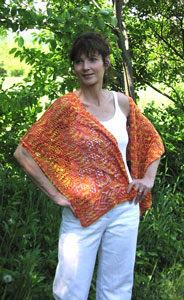 I will swatch for KnitSpot's Wings of The Moth and Goddess Knit's Desert Sun next. Long ago, I had Lisa Souza dye some mohair very light Mother of Pearl. The visual result is a glittery white, but up close, the yarn is actually composed of very faint pastels. I had my eye on the Moth for this back then, and finally dug out the pattern this morning. The picture of Desert Sun doesn't do it justice unless you are a brown fan. * The original one is shown in gold and it's lovely. I just happen to have two skeins of Claudia's Honey silk lace that would be perfect. Looks like Milk and Honey to me! Well, Milk, Honey, and Harry, is a better description. *In Japan, if someone asked me if I liked a particular brown yarn (or anything else), I would reply "Brown is not my favorite color." In America, I can express my opinion more directly: I loathe, despise, and abhor brown. I love handpainted yarns. I love lace yarns. 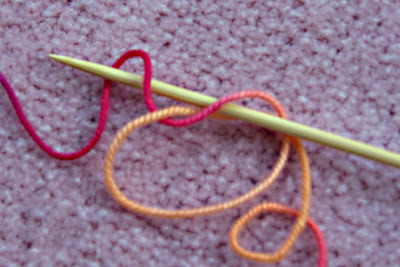 I do not love handpainted lace yarns. In the skein, they are glorious. When knitted into lace, they often look, well, is ghastly too strong a word? 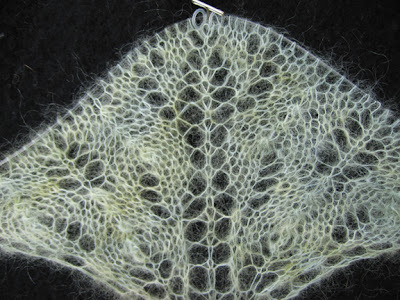 Now that the Icelandic shawl is finished (pix soon), I have been casting about for the next project. Of course, I had to scrutinize the current lace yarn offerings and I am sorry to report that virtually all the handpainted lace yarn I viewed this week is quite unsuitable for lace. 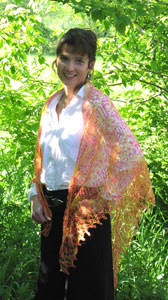 Let's take this exquisite shawl by Janice Kang as an example. Here it is knitted in dark hunter green. And here it is knitted in a famous handpaint. 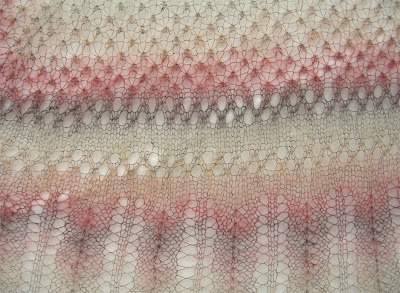 You can see a closeup picture of this stole on Janice's lovely blog. Unfortunately, it looks even worse in detail. 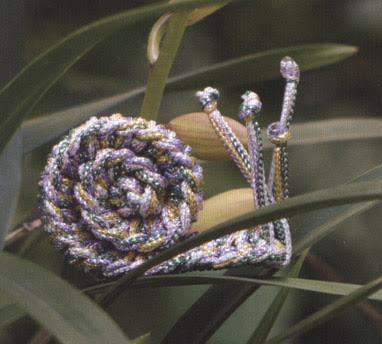 The breathtaking effect of the pattern is totally annihilated by the wildly variegated yarn. 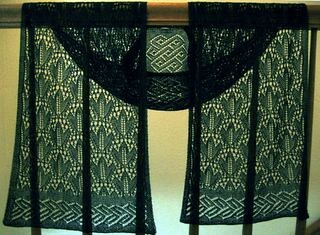 I acquired this design somewhere and couldn't discern the actual lace pattern until I Photoshopped the picture so the shawl was shaded as plain old black. It's very pretty, but you wouldn't know it from this picture. Note: Both these patterns are available here. 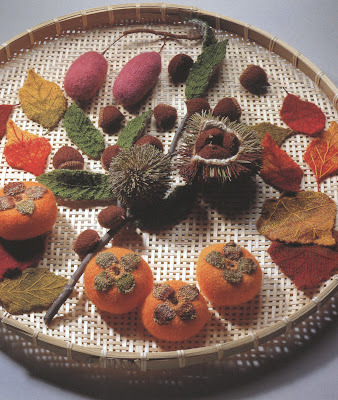 For the past several years, handpainters have showered knitters with a colorful riot of sock yarns. But what works for socks does not work for lace. A cornucopia of rich color rarely looks bad in a sock. In a shawl, though, the results can be, um, confusing. 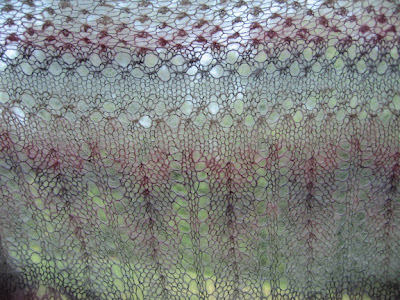 Lace can look lovely in a subtly variegated yarn. It also can look pretty with commercially printed yarns. For example, both my Swallowtail and my Icelandic shawls were knitted with the latter type of variegated yarns purchased in Japan. Yarn Place's Graceful and JoJoLand's Harmony lace yarns are two examples available in the U.S.. I've seen both knitted into lace, and the results are stunning. The long, gradual color blends produce quite a different effect from the short, abrupt flip-flops often seen with handpaints. I have a drawer full of handpainted lace yarn destined for the black or dark blue dye pot. I learned my lesson and won't purchase any more of the wildly assorted color mixes, no matter how seductive they look in the skein. If you are a handpaint artist and want to sell me lace yarn, you might want to tone down the palette. A lot. Store owners: I would be so grateful of you would seek out lace yarns that provide a bit of scintillation for the knitter without interfering with the actual pattern. You'll earn my heartfelt thanks, and I doubt I am the only lace knitter out there with a similar opinion. I spent about an hour trying to make a list of blogs to pass on the award, but I just couldn't decide (it's a Libra thing). I just love too many blogs, some of them written by non-girls (Hi to Kenny and Criminy Jickets!). If you post a comment and have a blog, I will always jump there and read the latest entry. And most of the time, I add the blog to my subscription list. It's always amazed me how many talented, articulate people there are in the knitting community and I am incredibly lucky to get to talk with all of you. Thanks to all of you for making blog reading (and writing!) one of the happiest moments of my day. On top is a cone of laceweight cashmere/lurex from Colourmart destined, I'm told, for Triinu's Shawl. The huge skein of fuzz is Artyarn's Kid Mohair/Silk (cheap from Little Knits) is for the Bee shawl. And the three little skeins on top of the fuzz are Suri Silk, from Ocean Wind Knits, via Wool Girl. No specific project in mind for this last. 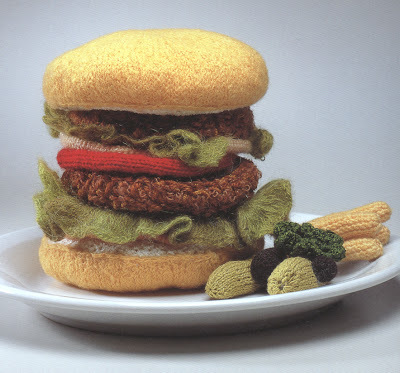 Do not go to Wool Girl if you are on a stash diet. On second thought, don't go to any of these places if you are on a stash diet. I truly dread the thought that Harry might move to the sandwich section of the refrigerator. I really do not want to open a package and view yarn in the color of liverwurst. Although the original looks like a horse blanket to me, the design was appealing enough (and free!) for me to raid the stash for a bit of variegated Richmore Count 10 mohair. It's not a very exciting knit, especially towards the end, which consists of a bazillion rows of k3tog, then k1p1k1 into one stitch. The yarn is so soft, though, that handling the knitting is a luxurious experience. 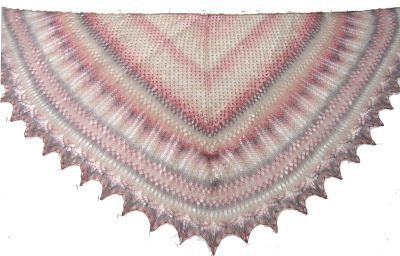 It's also my favorite shawl design that starts at the bottom with the maximum number of stitches and decreases to the neck edge. So as I get more and more bored, the rows get shorter and shorter. Then it's turned upside down and the edging is knitted on the provisional cast-on stitches. I am about three-quarters done with the body and have used only 500 meters of yarn, which will leave me enough of this yarn to use for another project. 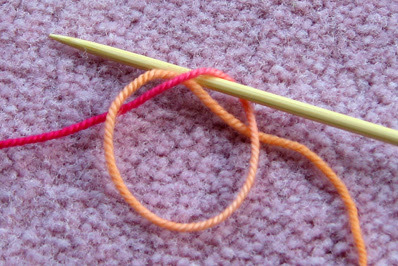 One tip: k1p1k1 is a lot easier if you use Norwegian Purl for the center stitch. Still plodding away on the Spider King edging. I think I have knitted sixteen miles of it so far, and am almost at the first corner. I ordered a bit of cashmere/silk and will let you know if it's worth the price. I haven't ordered anything from Yubina, but if you want to make an 500-yard cashmere shawlette for $6.99 (plus $4.95 flat rate shipping), go here and graze. The usual price seems to be $9.99, but they are having a sale. The prices are unbelievable and the lace yarn comes in 40 colors. They carry both 100% cashmere and a 45% cashmere, 50% silk blend ($9.99 for 50 grams/800 yards). * Order over $100, you get a "yarn winding machine." * On your third order, you get a 5% discount. * They carry merino sport and worsted weight yarn, too. 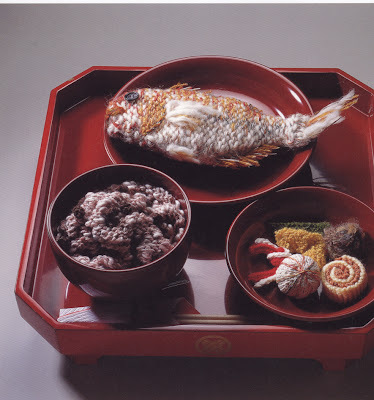 I found these in a strange little Japanese book called Wonderland. 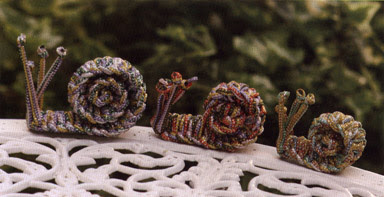 Not much else in the book worth mentioning, but I thought perhaps someone could figure out how to make these sweet, little snails. The technique looks like crochet to me. The rest of us will goggle at this publication and wonder how on earth did she do that? 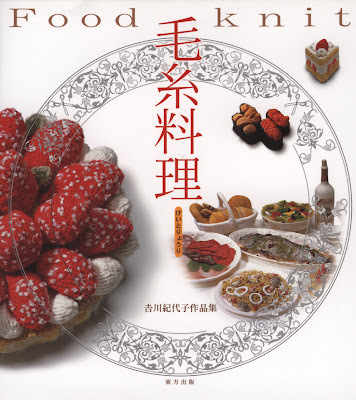 This book is composed entirely of knitted food photos. Sounds sort of stupid, but I am not talking about crude stuffed bananas or your basic felted oranges. 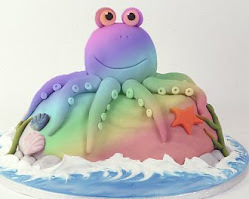 These confections are works of art. And a mind-boggling tour de force. 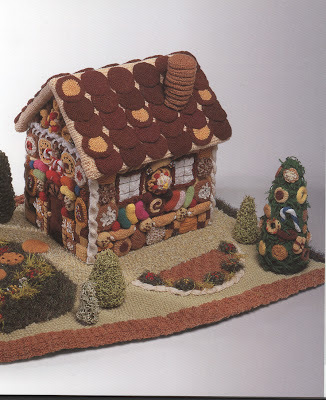 The back of the book offers a few simple instructions for making cookies and strawberries--neither of which make me rush to my needle stash. 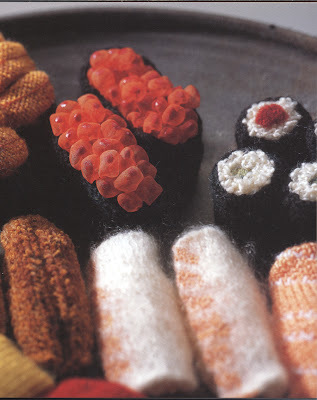 If you want to be amazed by an imaginative knitter, though, order this book.